This is the next super-yacht set to hit the world's oceans - which comes complete with its own functioning volcano and floating tropical islands. The vessel - dubbed the 'Tropical island Paradise' - has been designed by British boat builders Yacht Island Design, from Derby, Derbys - some 90 miles from the sea. The extravagant 295ft ship boasts a towering volcano with a cascading waterfall which feeds the swimming pool. And playboys will feel right at home with the ships helicopter landing pad and huge bar set behind a series of beach cabanas. Studio director Rob McPherson at the Derbyshire firm, who have also created the Streets of Monaco super-yacht, said: 'The exterior was designed to give the impression of waves breaking around a volcanic island, whilst maintaining the look of a contemporary yacht design. 'It comes with its own private beach cove and a waterfall cascading down from a volcano. 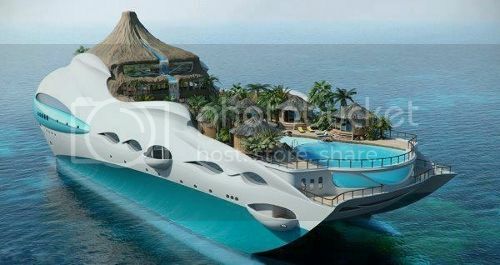 The lavish yacht can accommodate up to 10 guests - and can travel along at a top speed of 15 knots. The main deck is a secluded beach 'cove' of cabanas surrounding a massive ocean view swimming pool. 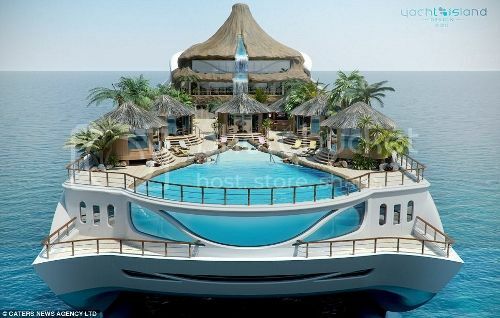 And should the millionaire future owners get tired of taking a dip in the pool, they can sail out into the sea on their very own floating island complete with deck chairs and palm trees. McPherson added: 'We had two reasons for designing such a boat. The first being that it's good fun, and secondly the current market is pretty saturated with designs that look fairly similar. Inside the huge, towering volcano is a cinema, library, games room, gym, spa and VIP suites - including an owners pad spread over two decks. The boat - which has yet to hit the market and hasn't had a price set - is causing waves in the boat building world with its unique design. Since it holds 10 people, all Gold Star Members and Rumpy are invited to join me for the launch party!! I'd rather VISIT places than drag a place around with me. A luxury Yacht as a base would be nice... but I'd like to get OFF to visit little grass huts and volcanoes. why not bring the island with you! OMG... IF ONLY!! IF ONLY! This Yacht Recreates an Entire City . I love the creativity of these yacht designers! Putting green? Sure. Hot tub(s) and pool(s)? Sure. Helipad? Of course. Volcano? Why? Getting facts right is a fundamental requirement of morality.